The Fairy Yarnmother business is a dream job. Not many people get to hang out in their homes and play with yarns all day….. but I do. I’ve got yarns and fiber all over this old house of mine, from the attic down to the basement. I hand paint them with whatever colors strike my fancy and enjoy each moment of the day. As if playing all day wasn’t good enough, I got my friends into the business too. They all get to play in their houses and create wonderful things to sell on the site too. My good fortune is due to several things; a great husband (Jim), wonderful friends (Riin, Lisa, Jean, Cristel, Karen, Pat, Barb… just to name a few), supportive customers and yarn fairies. 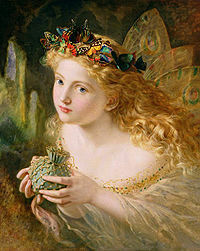 I dreamed of starting my own business but never took the first steps until I began to see fairies everywhere. They’re like my muses. They make things happen, magic things. 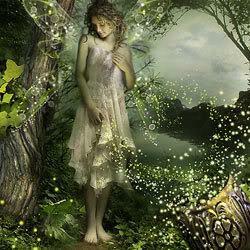 Everything becomes very clear when fairies come into your life. Most people don’t know that fairies are real. They think they were just characters written into the literature of the middle ages, but that’s all wrong. Fairies are living/breathing creatures of great heart and they live all about us if you just take the time to look for them. I count myself lucky that the fairies have decided to share my house with me. They make great friends. 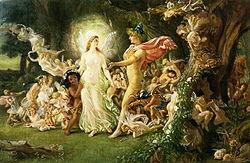 My hope for you, dear reader, is that you too start to see the fairies about you.